The first page of Landwehr’s letter to The Halbert Magazine. One of the things I hoped would happen while making 16 Photographs At Ohrdruf was that I would meet someone who served with my grandfather, Don Johnson. Don was a medic in the 365th Medical Battalion of the 65th Division. 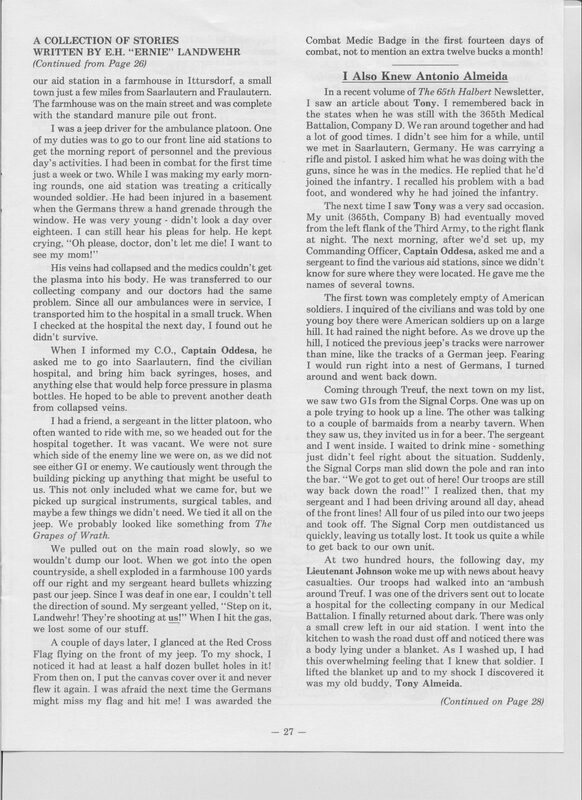 At the end of the war he was a 1st Lieutenant, and in his obituary says that he was a platoon leader in B Company. The second page of Landwehr’s letter to The Halbert Magazine. Unfortunately, I never met any veterans who served with him. The closest I came were Robert Patton and Edwin Waite, both of whom are in the film and served in the 65th, but neither knew Don. However, at the end of post-production when it was too late to include any new information in the film, I got an email from a woman named Cindy Williams. Cindy’s dad was Ernie Landwehr, a medic in B Company who knew my grandfather. 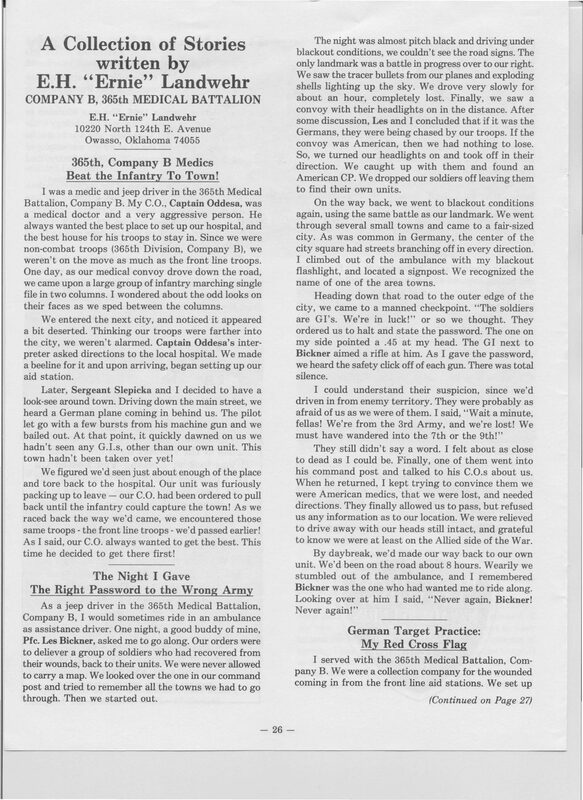 Ernie had passed away in the 90s, but in the film I had included one of his letters to the 65th Divisions magazine “The Halbert” provided by Patton, in which Landwehr told war stories that included my grandfather. The third page of Landwehr’s letter to The Halbert Magazine. Bob Patton copied/forwarded an email you sent to him, on to me tonight. 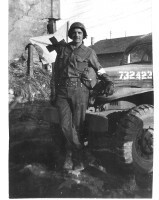 I am the daughter of a 65th Division medic and have become active in The Legacy Group, a branch of the 65th Division Association, which is how I know Bob. I am extremely interested in your film and what your research has shown. I would greatly like to talk to you via email or phone. Bob said your grandfather was in the same unit as my Dad! I cannot tell you how often I’ve looked for anyone who may have known my Dad, or even for other medics to talk to. 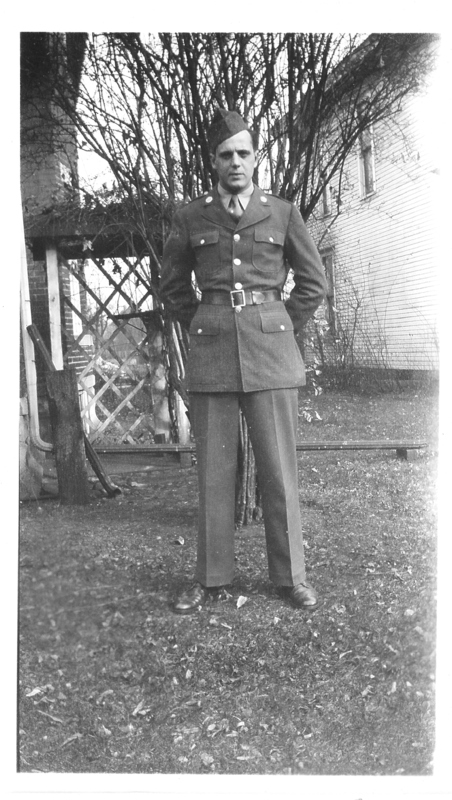 Dad’s name was: PFC Ernest H. Landwehr, 365th Med Bn, Company B. 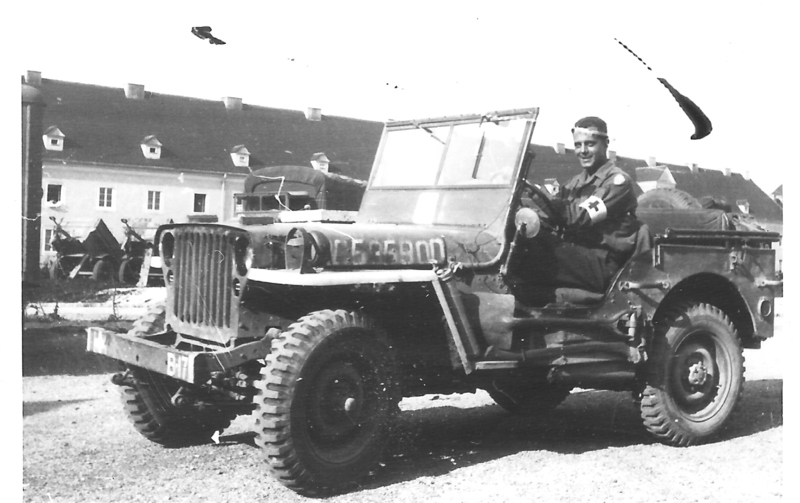 He told me this was an ambulance collection company, and also drove a jeep for his Lt. to scout out potential sites for Battalion aid stations. My best friend and hero, my Daddy, passed away 4 Nov 1993, apparently a couple years after your grandfather died. How he would have loved to contact your grandpa! My Dad, thankfully, had talked to me numerous times about his army service, and he had a number of pictures of Ordruf and the concentration camp prisoners also! Yes, I have these. 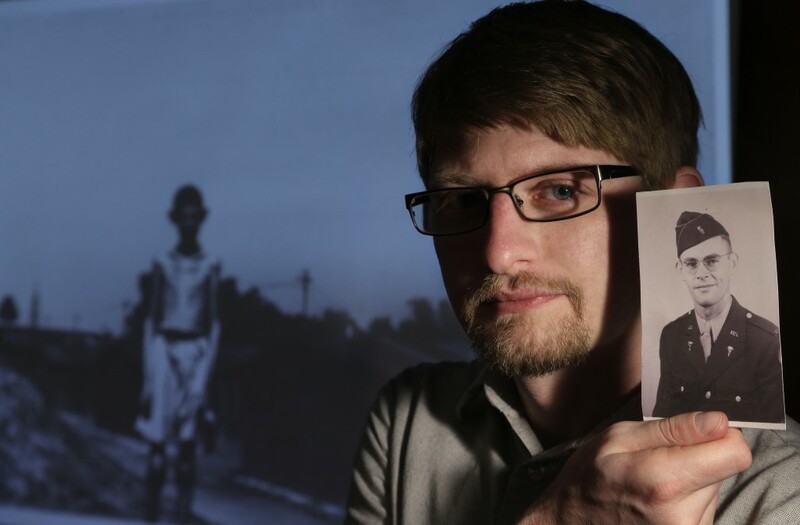 I have contributed several articles to The Halbert Newsletter (editing Dad’s dictation, when he was alive), and several on my own more recently, but I have never sent the concentration camp pictures in. Those images, which Dad showed me when I was a young teenager, are truly haunting. I feel blessed to have had a Dad like mine, who shared with me his first-hand experiences about the War, teaching me how evil can corrupt and destroy individuals and nations, and how to recognize it in all its forms today. Looking through the files provided by the 65th Division Association for my research, I’ve found that Ernie Landwehr wrote several letters to “The Halbert” over the years. I’ve reproduced one of them above, which is the one that mentions Lt. Johnson. The stories in the Halbert are what I wrote from my Dad’s notes and dictation. I’m very familiar with them and was absolutely astounded to know your Grandpa was my Dad’s LT. I know they probably knew each other quite well. I would have loved to have been able to talk to your Grandpa. I would love to see a picture of him. Please email me one of him during the War, and in later years, if you can. When you hear the same stories from another person, suddenly that history that you’ve heard for years begins to open up into a more fuller, three-dimensional view. Just knowing who your Grandpa was makes my Dad’s stories even more real to me. There is some more info I have about Ordruf from one of the 65th vets that I think might help you with the film you’re wrapping up–if you don’t already have it. I’ll drop you another line Thursday after my morning errands and explain. Isn’t my Dad handsome??? 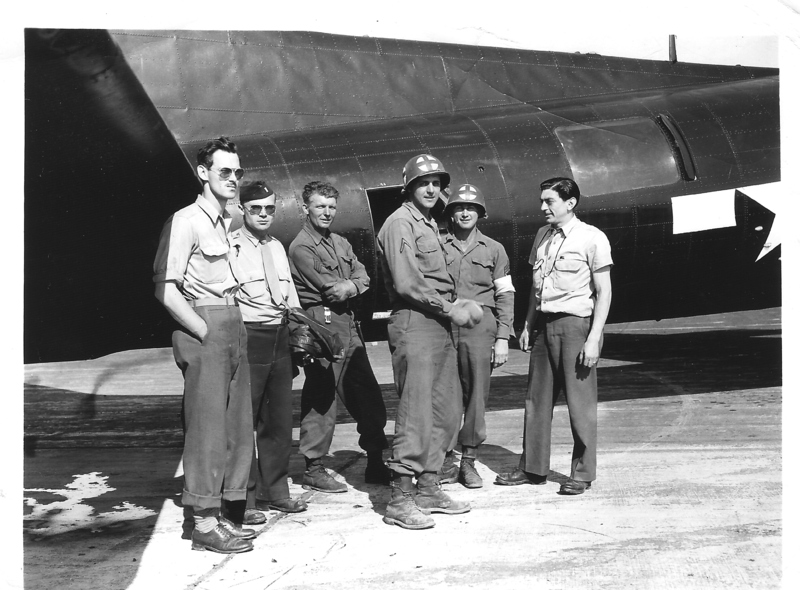 In the B17 picture, he’s the tall medic. 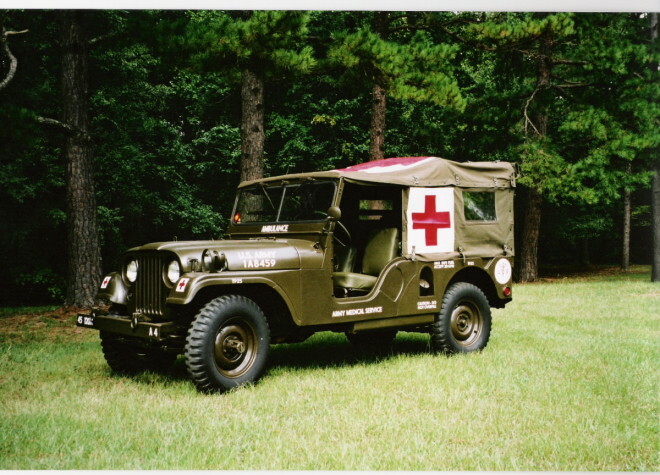 The red cross flag on the WC, was similar to the one he flew off the bumper of his jeep. I have a short little story about the flag, my Dad, your Grandpa and German target practice that I’m not sure was sent to the Halbert. What a great set of pictures! It’s amazing to see photos of someone who served in Don’s platoon. Thanks to Cindy for sharing!!!! 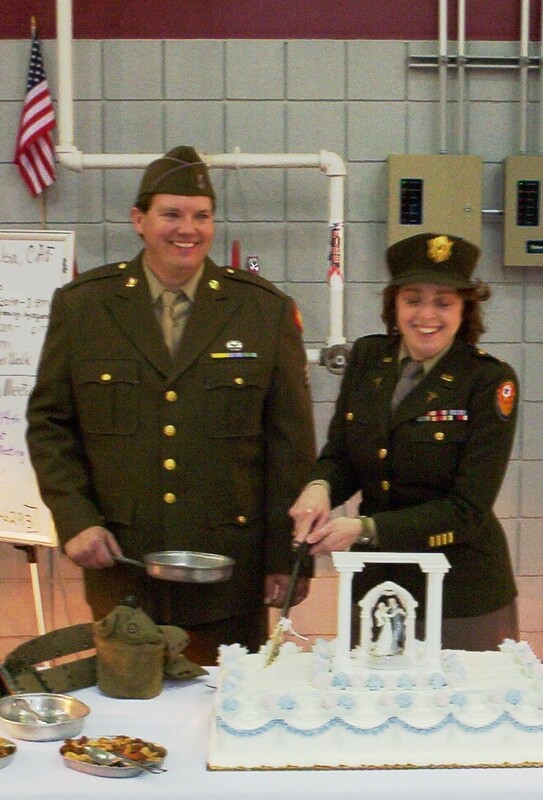 Several years after Dad died, I became involved in living history (Mexican War, Civil War, and now WWII era) and met my husband, Dean Williams (under the wings of a B-24 bomber named Diamond Lil). 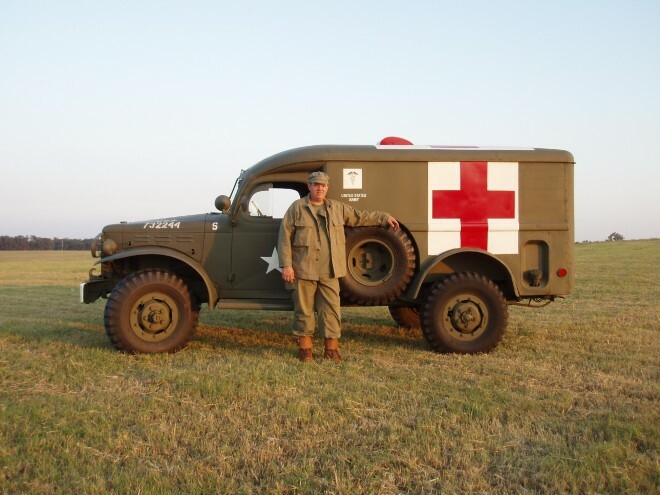 Together we own a large collection of medical militaria (medic and Army Nurse Corps) from the WWII – Korean War eras, including two ambulances in original, unrestored, driveable condition. 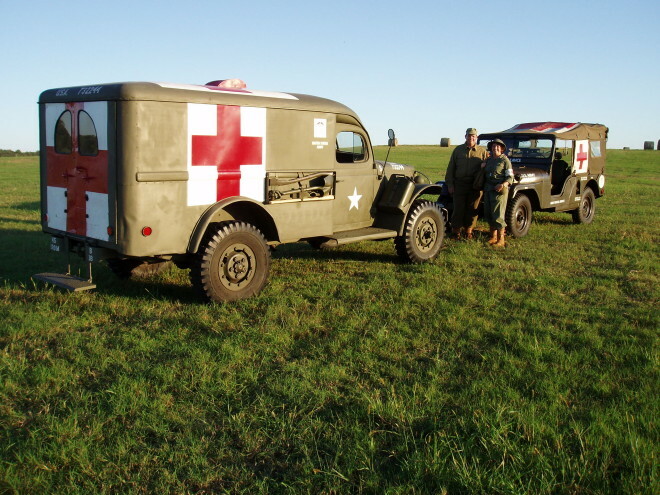 One of the ambulances, a 1944 WC-54 Dodge, is identical to the one my Dad drove in the ETO. This truck we own was actually somewhere in Europe during the War. Both ambulances are outfitted with medical gear, litters, etc….I will explain more about what we do in our “spare” time, and my background as a paramedic/nurse in another email, later. She included photos of the collection of WWII Army medic jeeps that she and her husband keep. I think that is such an amazing (if expensive!) way to remember the 365th and the medics of the war. Someday I’d love to make the trip to see them. Dean & Cindy Williams, with jeeps.